Over the past two weeks, hourly CO2 averages measured at the Mauna Loa Observatory have exceeded 400 parts per million for the first time. Over the next month, daily averages will likely exceed the 400 ppm milestone. By 2014, one or two months will show an excess of 400 ppm CO2 and by 2016 yearly averages will likely reach or exceed that extraordinarily high level. To find comparable CO2 levels in Earth’s geological past, one has to venture back in time 2.2 to 4.5 million years to the Pliocene climate epoc. So long ago, humankind, as we know it, was merely a glimmer in Earth’s eye. And the world was filled with strange animals and plants, many of whom do not survive today. The grasses and grains which would become the basis for world agriculture were just beginning to emerge. But they were not as plentiful nor as prosperous as they are today. During that time, sea levels averaged 75 feet higher than today, temperatures averaged 3-4 degrees Celsius warmer globally and 8-10 degrees hotter at the poles. Ellesmere Island, covered by glaciers today, hosted a forest. If CO2 remains above 400 ppm for any significant period, we can expect an eventual return to these conditions through a chaotic transition of glacial ice melt, major weather changes, major ocean changes, increasing air and ocean temperatures, and other dangerous and disruptive climate feedbacks as the Earth system seeks a new equilibrium. And this begs the question, will those same grasses and grains that developed into such abundance over this time survive and prosper through such a transition? The fate of human civilizations may well hang on the answer to this question. In the past 150 years, worldwide CO2 has increased by about 120 parts per million. At the current rate of increase, it will take a little more than two decades to reach 450 parts per million. In the context of geological history, this pace of increase is blindingly fast. Usually, an increase of 10 parts per million CO2 may occur over the course of 1000 years. Even the most rapid increases estimated in the last 60 million years were half as fast as those ongoing today. To get an idea of the immensity and rapidity of this pace of change, one need only look at the above graph. The graph starts 800,000 years ago. And, as you can see, CO2 concentrations regularly range between 300 ppm during interglacials and 175 ppm during ice ages. This progression continues unabated until we reach the present day when, at the very end of the graph, levels shoot like a rocket toward 400 ppm. In short, humans have pushed the Earth rapidly and radically toward a different climate. And we have yet to fully witness how this extremely radical pace of change will alter our world. Even worse, the pace of change is increasing. Humans added about 1 ppm CO2 to the atmosphere during the 1950s. We are now adding more than twice that level each and every year. 2011, the most recent year of recorded carbon emissions, showed the highest amounts ever dumped into the atmosphere. This is a pace that can no longer be sustained without serious and severe consequences. If fossil fuel emissions continue unabated over the next few decades, the changes due for 400+ ppm CO2 will be locked in for millenia. Even worse, if emissions continue to increase as they have and if climate feedbacks such as biosphere carbon and methane release begin to emerge, the world falls very rapidly onto the path of 600-1000 ppm CO2 by or before the end of this century. Following such a path would result in extraordinarily harmful and powerful changes to the Earth’s environment. Such changes would be so powerful and unprecedented that it is doubtful humans could effectively adapt to them. Some have said that 400 ppm CO2 is an arbitrary number. And that may well be the case. However, it marks a threshold of increasing danger and risk of harm. It is a sign-post showing that we are running out of time to reign in the worst impacts of climate change. It is a clear signal that we need to seriously address, reduce and eliminate greenhouse gas emissions over the course of the next few decades and that we must do so with a resolve not yet seen in the current crop of world leaders. This is both our challenge and our peril. We simply must respond. We simply must reduce and eliminate carbon emissions. Otherwise we are headed for a very, very dangerous world climate. One which may well be impossible to adapt to. In 2011, a historic drought severely impacted Texas. Shortly after, record floods hit the central US, pushing the Mississippi and its tributaries to record high levels while ending the Texas drought. One year later, a 55 year drought hit the heartland of the US pushing the Mississippi back to record low levels in many regions. Enter April 2013 and the weather has once more swung back to the flood extreme of what appears to be a new Drought, Flood, Drought paradigm. This winter, unusually heavy precipitation created a much larger than normal snowpack for the north-central US. Then, in April, warmer weather and a series of heavy rain events combined to push the Mississippi River and its tributaries from record low levels to record and near record high flood stage in many locations. Now, along the Mississippi and its tributaries, flood gauges are recording moderate to severe flooding at over 60 stations. But this selective dump of large volumes of precipitation over the Mississippi River valley has still left much of the western US in the grips of drought. In fact, 47% of the contiguous US is still suffering from drought even as many places in the Heartland flood. How can this happen? How can historic and opposite weather extremes such as severe drought and flood repeatedly affect the same region year after year? The answer lies in a re-currence of powerful blocking patterns that keep the polar jet stream in a fixed position for longer periods of time. The result is that weather in a given region tends to persist for longer and longer periods. So if weather gets stuck in a hot and dry pattern, as it did from April to December of 2012, then severe heat waves and drought conditions are most likely to follow. And if the jet stream switches back to a position where it plunges down from the Arctic, expect a long period of cooler and much wetter, stormier conditions, as the Central US experienced January to April of 2013 and which has resulted in the current major flood events. Looking at the ECMWF weather model forecast for Friday, May 3rd, we can see a persistence of the cool, stormy, wet pattern continuing for the Central US. Notice that long tongue of colder air plunging down all the way from northern Canada, through the central US and down into Texas? Sweeping along the trough is a low which will likely bring even more rain to flood-stricken areas later this week. This is the basic pattern that has persisted for the central US all throughout 2013. And the result is more cool air, more storms, and more precipitation for that region persisting for weeks and months on end. If we look to the west of this cold, wet trough zone, we can find its culprit. A blocking high pressure system that has parked itself just west of the US and Canadian Pacific coasts since this past January. This high is pulling warm, drier air up from the south. It is responsible for persisting drought conditions for the western US. And it is responsible for a big northward bulge in the polar jet stream running up over west-central Canada before an equally exaggerated southward swoop plunges down into the central US. Now, if we rewind to last year, we find an opposite jet stream configuration emerging as a result of a powerful blocking high pressure system forming directly over the central US and bringing record hot temperatures over a broad region. It is the increasingly frequent emergence of these powerful blocking systems that are keeping the weather in a drought-flood bipolarization for the central US. A growing number of climate scientists led by Jennifer Francis are attributing the greater frequency of blocking patterns and associated extreme weather events to the massive loss of Arctic sea ice since 1979. Overall, 80% of Arctic sea ice volume has been lost at end of Summer over the last 33 years. 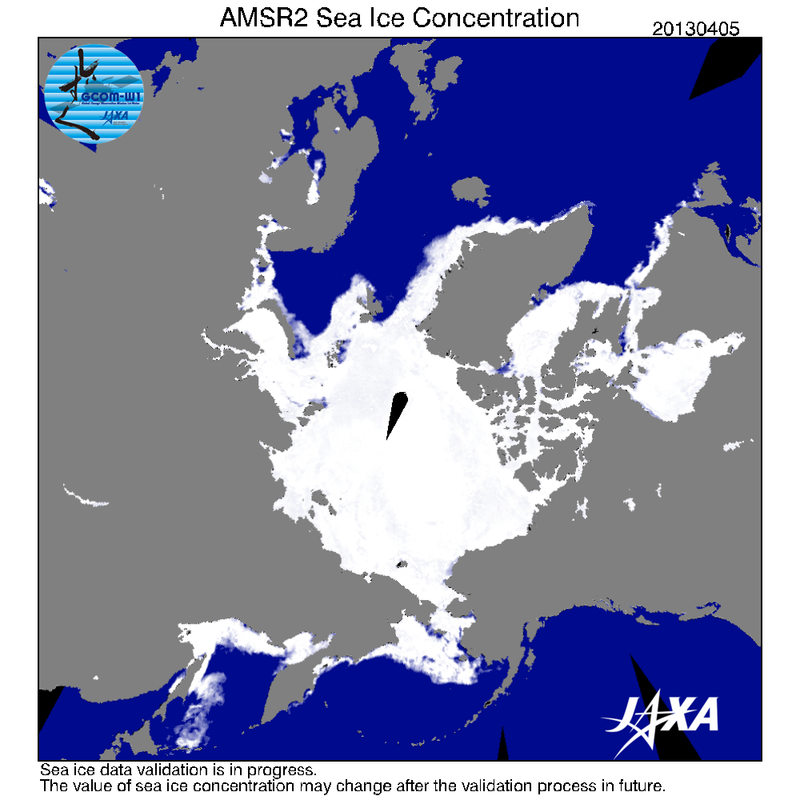 These climate scientists make a compelling observation that this ice which once trapped cold air to the north and kept warmer air confined to the south, has lost its insulating properties. Now, more warm air invades the Arctic even as more of the Arctic’s colder air tends to seep out into the mid-latitudes. The result is that the polar jet stream, which is powered by north-south temperature differences, both moves slower and forms the large, persistent, blocking wave patterns. After the current blocking pattern regime switches to the rapid Greenland ice melt regime, Dr. Hansen warns of the potential for ‘continent size frontal storms that pack the strength of hurricanes.’ Such storms would make Sandy seem like kitten’s play. How do we avoid a continued worsening and more extreme climate? Simple. Stop emitting CO2 into the atmosphere. The sooner CO2 emission reduction and elimination policies are put into place, the less likely the very worst weather changes will emerge. But, until we make the wise, rational choice of CO2 reduction and elimination, we consign ourselves to what is most likely to be a decadal period of worsening and more extreme weather. 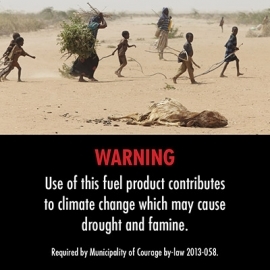 According to reports from Triple Pundit, a Canadian Lawyer by the name of Robert Shirkey is pushing to have climate change warning labels placed on gas pumps throughout Canada. The campaign, available at its website ourhorizon.org, is lobbying for states and municipalities to place labels on gasoline and other fossil fuel based products to raise awareness and generate impetus for change. Shirkey’s campaign is also driven by an awareness that only 16 years of the current pace of fossil fuel burning is necessary to put the world’s climate on an inevitable collision with a disastrous 2 degree or more temperature increase before the end of this century. Shirkey’s campaign encourages people to send letters and emails to each of the 4,000 municipalities in Canada in a push to slap warning labels on fossil fuel products. The campaigns are market based and receives funding via crowd-sourcing. Each campaign states goals and provides the total funding needed to complete. Our Horizon is a reference to the disastrous Deepwater Horizon oil spill that damaged so much of the US Gulf Coast and Gulf of Mexico. As noted above, it is also an allegory to the rather brief period of time left to avoid the worst impacts of human caused climate change. Warning labels were an effective means of reducing cigarette use in the US and Canada. The labels raised awareness, provided visible evidence of risk, and tended to reduce consumption of labeled items. Given the fact that worldwide human greenhouse gas emissions will likely result in a far greater risk to human life and health than even tobacco smoking, it is surprising that similar efforts haven’t already been pursued. Let’s hope similar campaigns spring up in the United States and other countries. Despite an atmospheric train wreck that resulted in stormy weather and below average temperatures for much of Europe and some of the United States, global surface temperatures for March of 2013 were the 10th hottest on record. Large areas south of Australia and over central and northern China experienced their hottest month ever recorded. No monitoring regions experienced their lowest temperature on record. ENSO neutral conditions remained in force throughout March of 2013. While La Nina conditions tend to cool global surface temperatures and transport atmospheric heat into the deeper ocean, El Nino produces an opposite effect, dumping ocean heat content into the atmosphere and causing surface temperatures to spike. By contrast, ENSO neutral conditions tend to result in more moderate temperatures. With ENSO neutral conditions extending back to the start of 2013, the period of January through March was the 8th hottest on record. Global land and ocean surface temperatures pushed 1.04 degrees Fahrenheit above the 20th century average for this time of year. As with March, no regions on the surface of Earth experienced record low temperatures. In contrast, a massive region south of Australia experienced their warmest temperatures since record-taking began. The above image provided by NOAA shows broad swaths of much warmer than average temperatures spreading over most of the world’s tropics, spilling out over Australia and down toward Antarctica. Most of the globe experienced some degree of warmer than average temperatures. In contrast, cooler than average areas were confined to isolated parts of Siberia, Europe, and the western Pacific. In comparison with January through March of 2012, global temperatures for the same period during 2013 were about .3 degrees Fahrenheit warmer. This temperature increase was likely driven by a slow transition from La Nina to ENSO neutral conditions combined with the long-term upward forcing on temperatures resulting from human greenhouse gas emissions. Back in the early 2000s, Portugal decided to make a major change to its energy structure. It invested heavily in building wind, hydro, solar and vehicle to grid infrastructure. The government created a corporation that bought out the power infrastructure and invested money in creating a smart grid. By 2010, 45% of all of Portugal’s energy came from renewables. And, for the first time, Portugal ran 70% of its economy on entirely renewable energy during the first quarter of this year (the vast majority of which was provided by wind and hydro power). Portugal has produced a stunning achievement. It has increased renewable energy capacity even as it heightened efficiency and constructed a large network of electric vehicle charging stations. Once mostly reliant on fossil fuel imports, Portugal now exports electricity — 6% of that produced so far this year. These innovations are providing Portugal with key economic advantages during what has been a very difficult time for the nation. These advantages will help it continue to trim its trade deficit and keep more of its own money in-country, reducing reliance on debt and fiat inflationary tools. Many agencies and think tanks have said that such a level of renewable energy adoption is not possible. But Portugal, a small and economically challenged European country, has done it all in just one decade. With its smart grid and network of electric vehicle charging stations, Portugal is now able to continue to increase its renewable energy capacity on up to 100% — a goal that all nations should aspire to. Portugal provides a good example of how economies can rapidly switch to renewable energy. Such switches will be entirely necessary as the next few decades proceed and the shocks of human-caused climate change intensify. 70 Percent Renewable Power Possible? Worldwide CO2 averages inched slightly higher last week topping 398.08 ppm. This measure is 2.87 parts per million higher than for the same week last year and 21.21 parts per million higher than the value recorded for the same week in 2003. To find sustained levels of CO2 comparable to those measured during the week of March 31, we have to go back more than 2 million years into Earth’s geological past. This change has at a remarkable and increasing pace over the past 130 years. In that period, world CO2 levels have risen from about 275 parts per million to the extraordinarily high levels we see today. This jump of about 120 parts per million CO2 was caused by rampant burning of fossil fuels in the period of 1880 through 2013. Long term temperature averages in a world of 400 ppm CO2, according to paleoclimate, are between 2-3 degrees Celsius warmer than 20th century averages. Sea levels are 15-75 feet higher and both weather and climates are radically different. But it is important to note that the human addition of 120 parts per million CO2 is just an initial forcing to the world’s climate system. This large forcing, occurring at about 10 times more rapidly than any comparable forcing in the geological past, presents a high risk of resulting in feedbacks from the Earth’s environment that pump even more CO2 and other greenhouse gasses into the atmosphere. Loss of glaciers and reduced overall albedo will also result in the removal of a key cooling feature. These responses, at best, are likely to keep worldwide CO2 levels at or just below current high marks for hundreds or thousands of years even if all emissions immediately cease. The result is that a long-term trend of warming and somewhat harmful climate change is mostly locked in. At the worst case, we enter a period of amplifying feedbacks where the Earth contributes large volumes of CO2 and other greenhouse gasses comparable to the amount humans have already pumped into the atmosphere. Both of these scenarios are probably survivable. 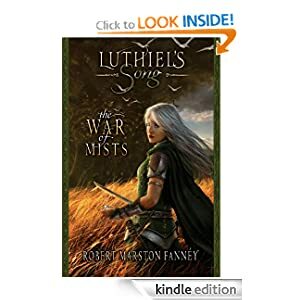 But both involve substantial increased risk of damaging Earth changes, altered and erratic weather patterns, and increased instances of damaging, extreme events. So it must be emphasized that we are at the threshold of a period of increasing harm now and that continuing to pump CO2 into the atmosphere at increasing rates is simply a devastating regime of self-inflicted harm. In such a case, we risk runaway climate change of a kind that would be impossible for humans and civilizations to adapt to long-term. The only wise, sane choice would be to draw down CO2 and greenhouse gas emission as rapidly as possible. Sadly, the rate of CO2 emission is increasing. 2013 or 2014 will likely see world CO2 levels cross the 400 ppm threshold. But at the current rate at which the world continues to burn fossil fuels this marker will only serve as a milepost on a road toward increasingly damaging and catastrophic harm. Kenneth Dunton, Professor of Marine Sciences at the University of Texas, Austin, in the above video describes what he calles “The New Arctic.” It is a sobering video describing a landscape at the beginning of a difficult transition. He talks about adaptation. And, to a certain degree, we will all have to adapt to changes we are now causing to the world’s environments. How difficult these changes will be will, ultimately hinge upon how soon we can reduce then cease the burning of all fossil fuels. What Dr. Dunton describes is the start of a difficult situation. One that will be with us for many years, decades, and perhaps centuries to come. Yesterday, we reported a preliminary observation that the pace of Arctic spring sea ice melt was picking up. Today, most sea ice monitors now confirm this observation. 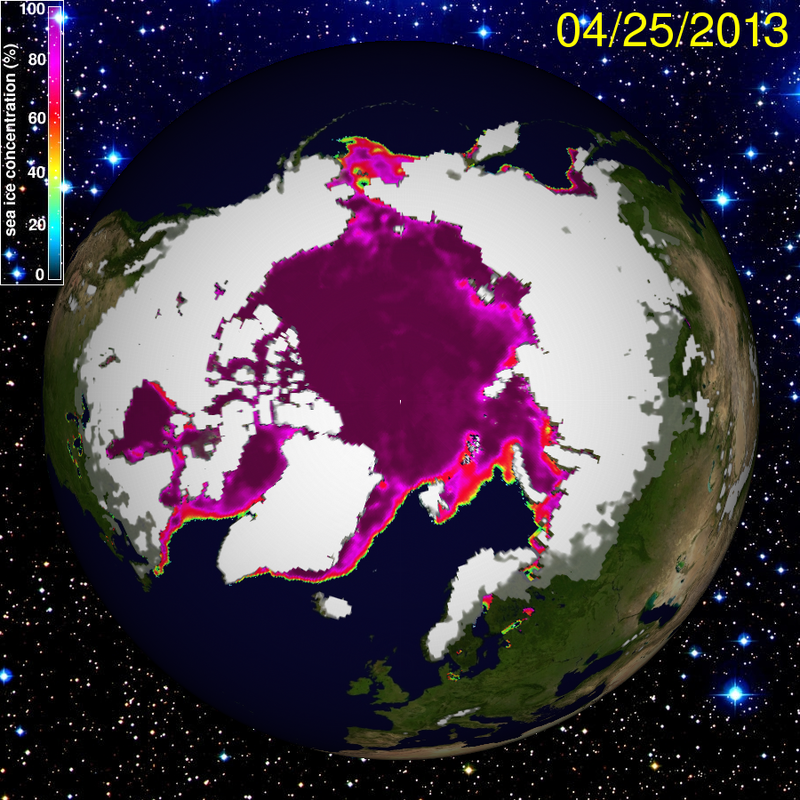 According to Cryosphere Today, sea ice area has fallen to 13.31 million square kilometers. This measure is about 55,000 square kilometers lower than yesterday and about 490,000 square kilometers below its peak last month. This daily pace of melt is a rather steep rate of loss for April and remains about 150,000 square kilometers below values for this date last year. 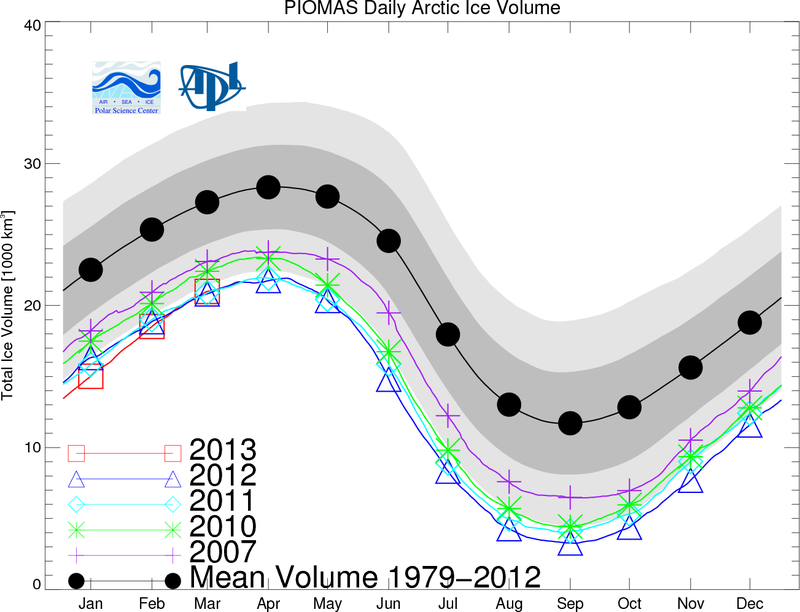 Finally, PIOMAS recently updated its sea ice volume monitor today. 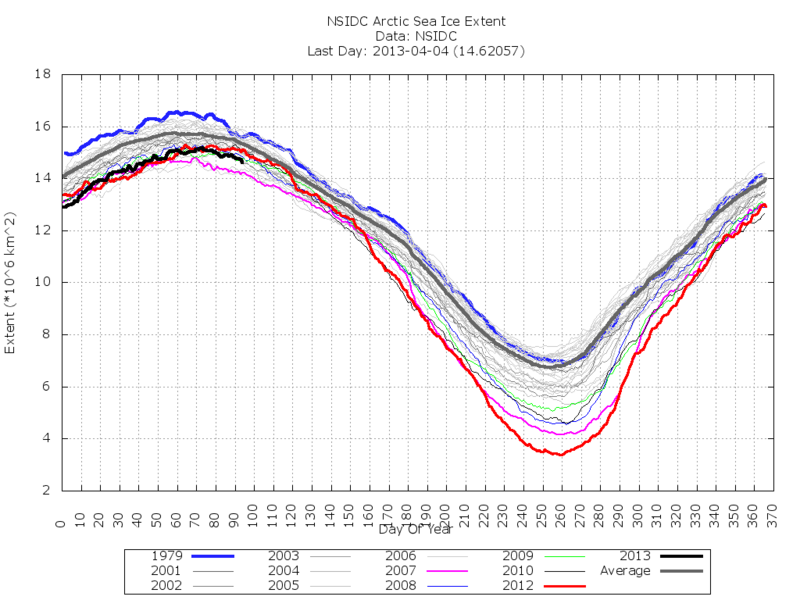 It’s currently showing sea ice volume on par with record low levels set last year and in 2011. 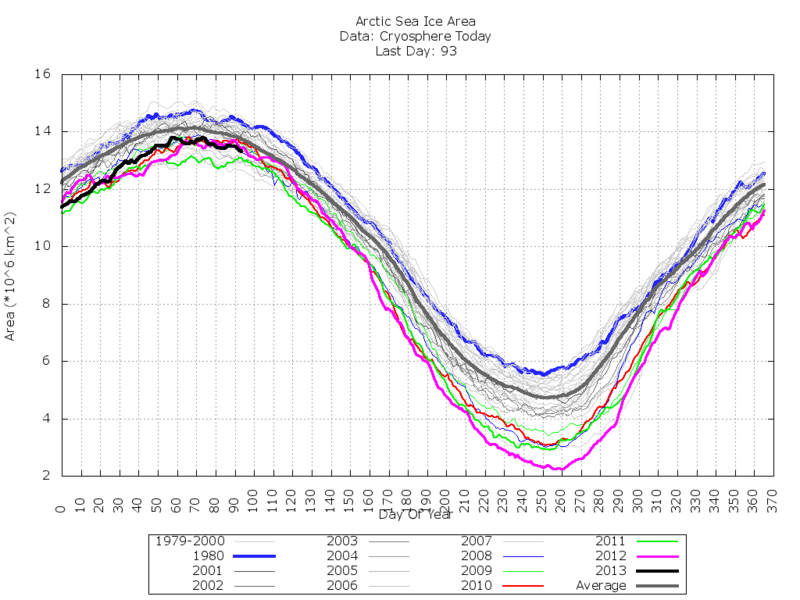 These levels show sea ice volume currently in the range of 21,500 cubic kilometers. 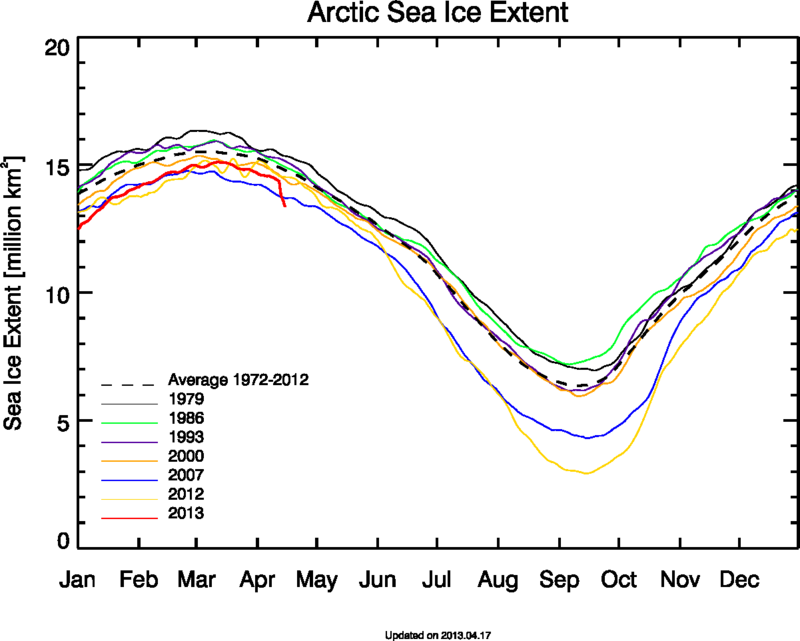 Though at around the same values as 2011 and 2012 overall, what this volume measure does not show is the degree to which multi-year ice (MYI) has receded and thinned. MYI is currently also near record low values. Unfortunately, the sea ice is now thicker at its edge and in regions that are almost certain to melt out as the spring and summer seasons progress and thinner near Greenland, where ice has typically sheltered from summer melt. If this observation holds, volume appears set to challenge the record low established just last year. Various specific regions of the Arctic are currently undergoing visible thinning and breakage. 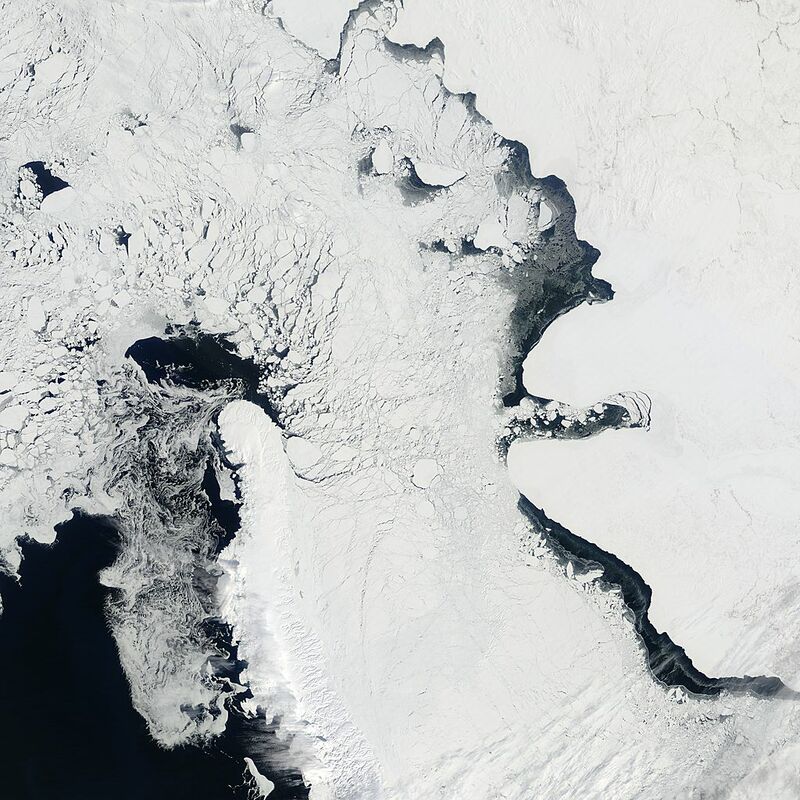 In the Sea of Okhotsk, thinning and breakage of sea ice appears to be rapid, especially in the sea’s southern regions. The Bering Sea is also showing signs of thinning, with polynas opening throughout the region. North of Alaska, the sea ice is again thinning, with open water occasionally visible in the distant off-shore from Barrow Alaska over the past couple of days. Across the Arctic, polynas are also visible in the Kara and Barents Seas. Nearer to Greenland and Canada, polynas are showing up near Thule and Cape Dorset. Overall, the Arctic remains much warmer than average for this time of year. Averages are about 5-7 degrees hotter than usual over most of the region. The hot spot, near Nuuk and Baffin Bay exceeds 15 degrees above average with Nuuk showing its second 52 degree Fahrenheit day in a row. Despite temperatures remaining above average for much of the Arctic, most of the Arctic remains under weather conditions that are below the -1.9 degree C freezing point of ocean water. That said, invasions of warmer air from the south are increasing, especially in the region near Greenland, which has been affected by much warmer temperatures than usual for almost the entire winter. Warmer sea surface temperatures are also expanding, with most of the Arctic sea surface at around .5 degrees Celsius above average with localized hot spots. Most sea surface temps remain below the fresh water freezing point. 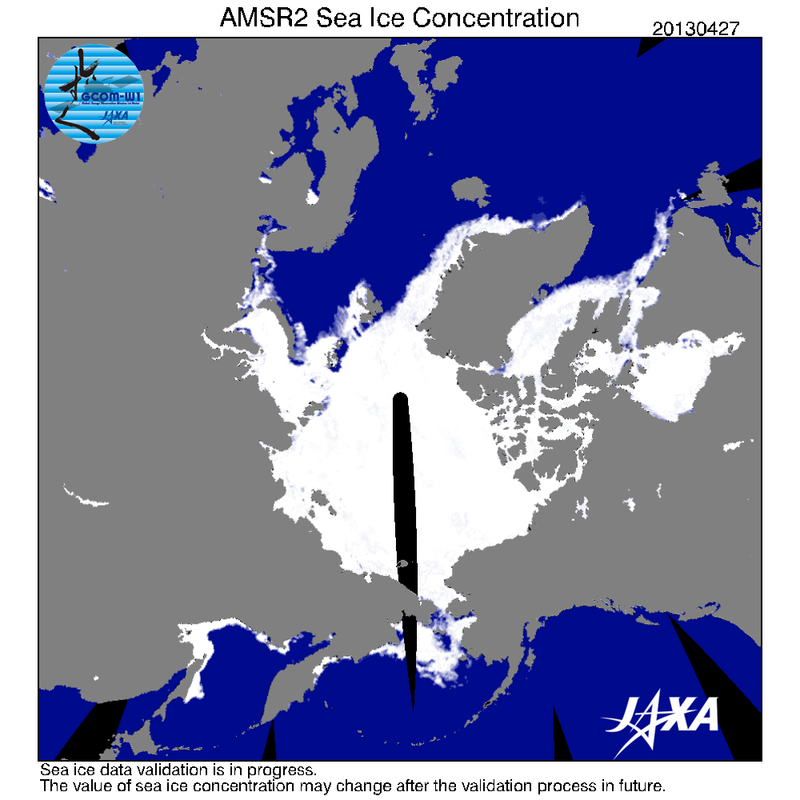 But large and expanding areas show water temperatures above -1.9 degrees C, the freezing temperatures of ocean water. Lastly, warmer than usual air temperatures appear to finally be having their effect on Greenland, with a small region of the extreme southern glacier showing surface melt. Melt doesn’t usually begin until mid to late May for Greenland. So we’ll have to see if this report is just sporadic or the beginning of a trend. Overall, these conditions favor continued melt with a higher risk of melt proceeding at a more rapid pace than usual for this time of year. In 2011, the world emitted more than 10 billion tons of carbon into the atmosphere and the amount for 2012 is likely to exceed 11 billion tons. This massive pace of carbon emissions puts the world directly on the worst-case path of human-caused climate change. This path, modeled by IPCC as the A1FI is the highest CO2 emissions scenario resulting in the most global temperature increase and/or the most drastic alterations to the global environment. A1FI model range starts in 2000 and, as you can see, the pace of CO2 emission increase follows directly along this worst-case path through 2011. What this also shows is that the world, overall, has neither pursued a balance (A1B) between fossil fuels and renewables or a transition (A1T) from fossil fuel to renewable energy. Instead, the rate of global carbon emissions increase since 2000 shows that the world has chosen to emphasize fossil fuel use and chosen not to invest in alternative energy to the degree that it replaces carbon-based fuels. This is not to say that certain countries haven’t made great strides. 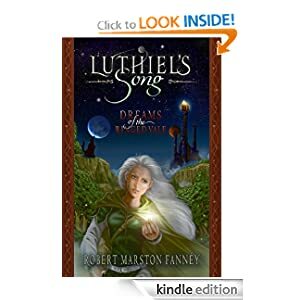 But it does show that, overall, the world has failed to put in place the investments and technologies that will allow it to transition away from fossil fuels that dump massive volumes of dangerous CO2 into the atmosphere. One can see the preference the world has placed on continued fossil fuel burning by looking at the discrepancy between worldwide subsidies of oil vs worldwide renewable energy subsidies. On the one hand, oil subsidies are in the range of 500 billion dollars each year while worldwide renewable energy subsidies are less than 1/5 that number. And what does all this emphasis on fossil fuels buy us, in the end? According to A1FI climate models, world temperatures increase by an average of 6.4 degrees Celsius by 2100 to devastating and terrible effect. This ‘catastrophic high burn’ scenario would leave posterity with a hellish world, one that grows steadily more hellish until global temperature increases top 12 degrees Celsius by 2300. My view, is that this future is not worth one cent, much less the 500 billion dollars plus we pay each year to subsidize it. 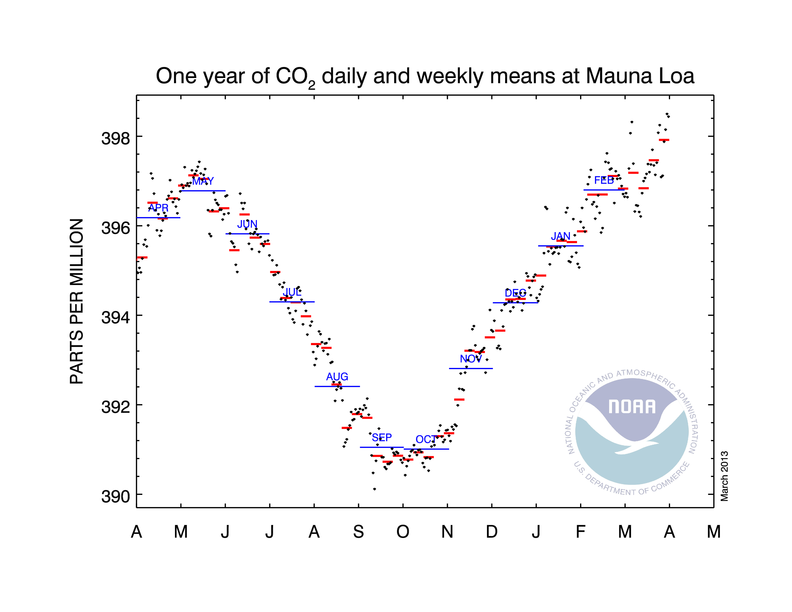 According to reports from the Mauna Loa Observatory, worldwide CO2 averages for last week were 397.92 ppm. Daily measurements showed CO2 levels exceeding 398 ppm. 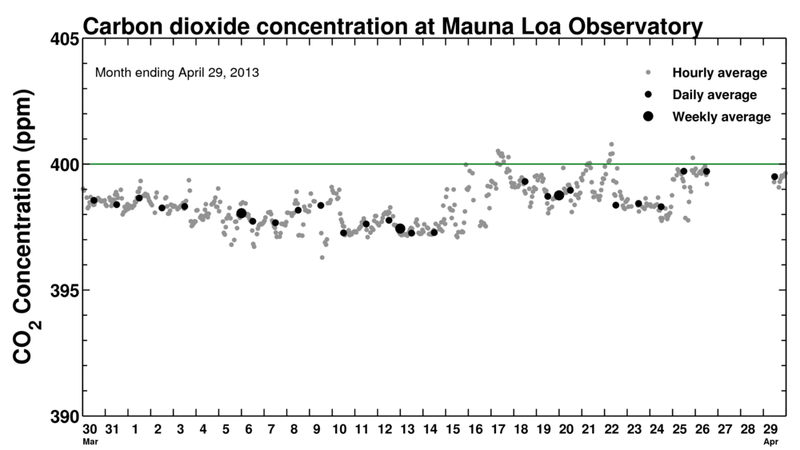 And it appears likely that monthly CO2 averages for March will be in the range of 397.5 ppm. At this pace, it appears that worldwide CO2 will come very close to touching 400 ppm averages in May of this year and will certainly exceed the 400 ppm threshold by 2014. Scientists have set the safe limit for worldwide CO2 levels at 350 ppm. We are currently far in excess of that number. 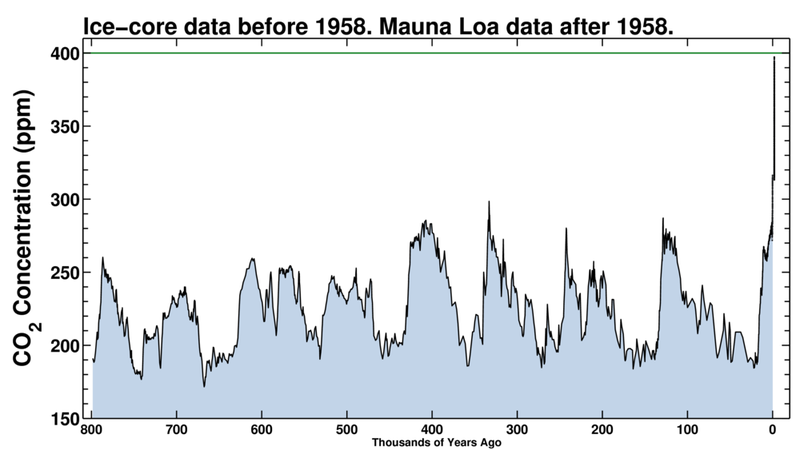 The last time CO2 was 400 ppm was between 2-3 million years ago. So a sustained CO2 of this level over long periods would continue to drive radical environmental changes. A world with average CO2 of 400 ppm, according to paleoclimate, eventually becomes 2-3 degrees hotter than today. Sea levels in such a world rise, over time, and eventually stabilize between 15 and 75 feet higher than today. The average pace of CO2 increase over the past ten years is more than 2 ppm each year. This pace of increase is many times faster than any period in the geological record. At 400 ppm, worldwide CO2 will be about 125 ppm higher than in 1880. During the ice age, worldwide CO2 averaged around 190 ppm. 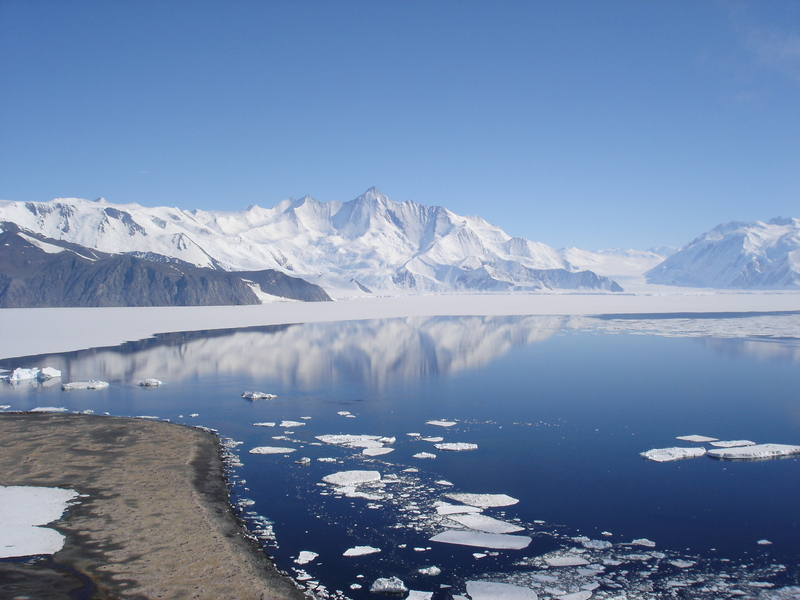 The jump from 190 ppm to 275 ppm set off changes in Earth’s heat balance that increased global temperatures by more than 5 degrees Celsius, melted the great Laurentide ice sheet, and caused sea levels to rise by scores of feet. Under business as usual fossil fuel burning, scientists expect world CO2 levels to reach between 600 and 850 ppm by the end of this century. Such high levels of CO2 have not been seen for 6 million years or more. Further, the massive forcing a jump to 600 to 850 ppm would induce would likely result in feedbacks that continue to push worldwide greenhouse gasses even higher. Many scientists believe that this would result in enough heat increases to make the world very hostile to life. Global warming has mangled the Northern hemisphere’s weather. No clearer indication of this is the fact that currently, where I’m sitting in Gaithersburg, MD it’s 48 degrees Fahrenheit. Now let’s jump northward. Way north. North of the Arctic Circle north. So far north that only tens of miles away rests a glacier hundreds of meters thick. That’s right, we’re talking about Greenland. Nuuk, Greenland to be specific. What’s the temperature there currently at 3:51 PM, Gaithersburg time? The fact that two places separated so far north and south can experience practically the same weather is a perfect illustration of what global warming combined with Arctic sea ice melt has done to our weather patterns. Currently, a powerful blocking pattern and a very wavy jet stream is plunging far to the south and into the eastern United States. That jet stream has origins in the Arctic, so it is currently involved in cooling down Gaithersburg, Maryland. The jet currently running down over the eastern US drinks deep of warmer temperate and tropical air before making a hairpin turn to the north, it travels up over the Atlantic Ocean, keeps making its way north until, at last, it comes to Greenland, depositing 48 degree Gaitherburg air directly over where it should be freezing in Nuuk. That 48 degree temperature is a veritable heatwave for Nuuk at this time of year. The average daily high for this date is 26 degrees Fahrenheit. Nuuk’s high for today is 22 degrees warmer than it should be. And it’s not just today. 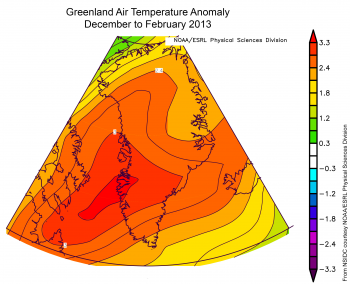 For much of the winter Greenland has been far, far hotter than usual. The below graph, provided by NSIDC shows average temperatures for the Nuuk region of Greenland being about 5 degrees Fahrenheit or 3.3 degrees Celsius above average for the entire period. Persistent warmer temperatures for Greenland have been a typical result of the new, global warming spawned weather pattern. It is this weather pattern that resulted in a major melt event for Greenland last summer. One that wrecked infrastructure there and contributed mightily to a 1 cm rise in sea level in just one year. Well, that blocking pattern is still in place. 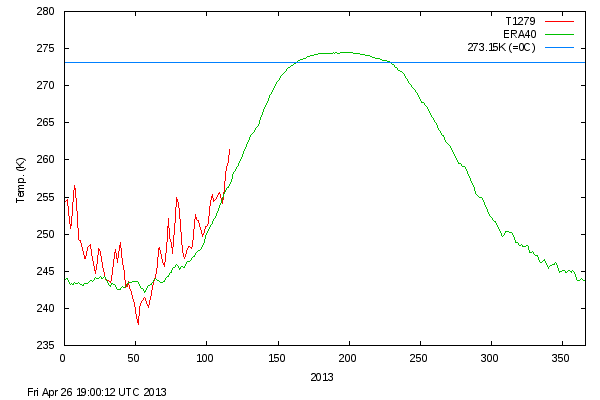 Going into the spring/summer of 2013, the weather is still stuck in a much hotter than usual mode for Greenland. If it continues, it will likely mean both more glacial melt and more extreme weather. Models Show 975 Mb Low Forming in Arctic by April 13. Could This Potential Cyclone Enhance Early Season Melt? It’s a long way out, but current weather model forecasts show a strong storm forming over central Russia and moving north into the Arctic Ocean by mid-April. 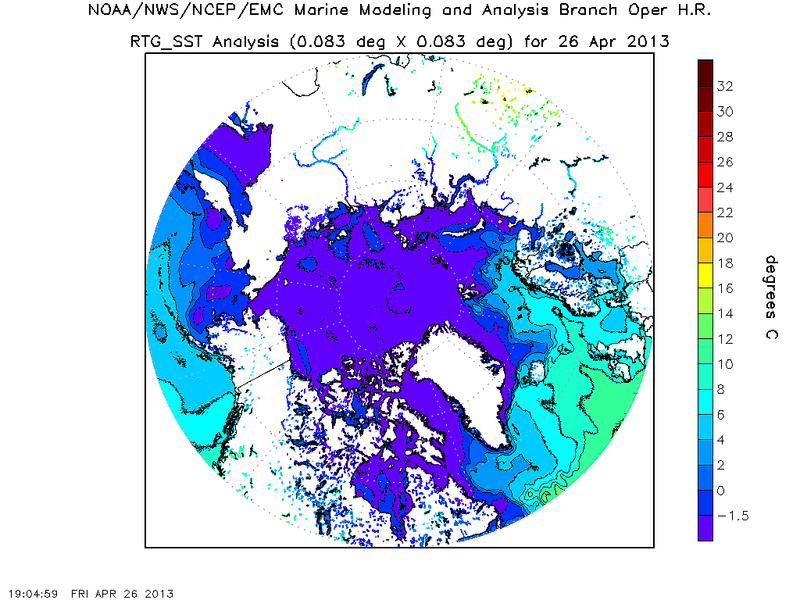 Models show a major storm tearing up through Russia, gaining strength as it comes to the sea ice edge on April 13th. The storm drops down to around 975 mb by this time, a pressure comparable to a weak to moderate strength hurricane. However, the effects of such a system would be spread over a broader area, so peak wind speeds probably wouldn’t approach that of a comparable tropical system. Nonethelss, such a storm has the potential to drive strong winds into the region, possibly disrupting an area of historically thin sea ice. The back side of the storm also digs deep into the mid-latitudes, pulling up warmer air from the south. Such processes could enhance early season sea ice melt and breakage, especially given the demonstrated fragility of sea ice during both the summer of 2012 and the winter of 2013. There isn’t too much precedent for strong storms disrupting spring ice so early in the year. But the Great Arctic Cyclone of the summer of 2012 and brisk winds offshore setting off a major sea ice cracking event from February to March of 2013 provide evidence of the severely fragile state of Arctic sea ice. So it can’t be entirely ruled out that a strong storm system such as the one predicted could have a major impact. The date, April 13, is still a long way off. 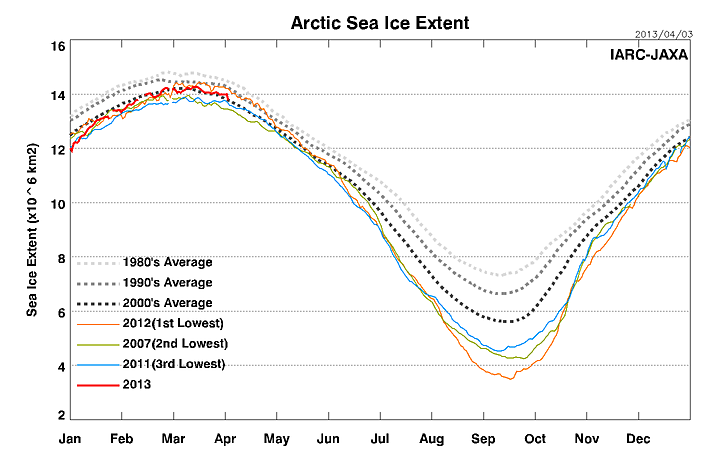 But if the storm emerges as predicted, we may see yet one more major Arctic ice event in the coming weeks. One with the potential to accelerate early season melt and break-up. Definitely something to keep a watchful eye on.